Israel Army IDF Tzabar Givati Regiment Insignia. he Givati Brigade is one of the infantry brigades in the Israel Defense Forces. It was formed in December 1948 and placed under the command of Shimon Avidan. Before that it participated in Operation Yoav (October 15-22, 1948). Its role was to capture the areas of Hulikat, Kawkaba and the junction which is today known as the Givati Junction. Later it was disbanded but was reestablished in 1983 and still exists today. Since 1999 it serves under the Southern Command (Pikud Darom). Givati soldiers are designated by purple berets. 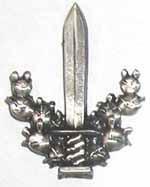 The Brigade's symbol is the fox, alluding to Shualei Shimshon (lit. Samson's Foxes), a unit in the 1948 Arab-Israeli War. As of 2007, the Givati brigade is organized into three main battalions: Shaked, Tzabar, and Rotem, in addition to associated reconnaissance, engineering, and other units.